The fact that exercise balls go beyond just improving stability is hardly known. In fact there are a variety of exercise balls that can help you stay fit. An equipment that is versatile and easy to handle, the exercise ball is a hands down winner. Well for one, this is something we all associate with our childhood and naturally there is a sense of déjà vu when you start using it. The range of exercise balls is huge and each of them can help in exercising different body parts. The stability ball is basically used to improve the core strength of a person and a lot of core stabilizing muscles are involved to maintain balance. A mini ball is small in size as compared to stability ball but they add a lot of leverage and instability challenges to exercise. The medicine ball, is heavy and small in size and does not roll on floor like other balls. The weight range starts from 8 pounds to 16 pounds and its weight adds to the difficulty. A small weighted toning ball usually comes in 1-6 pounds in size and is mainly used for muscle toning instead of dumbell or barbell. Small therapy balls are basically used for medical purpose as it helps in physio therapies and neurological problems. Ishwari Patil, General Nutrition Centres (GNC) Expert explains, “the Swiss ball is larger in size and filled with air as compared to the medicine ball which is smaller in size and weighted. The Swiss Ball (or gym ball, physio ball, fit ball) is a versatile fitness tool that can be used for core strength, core stability, stretching, yoga and Pilates. On the other hand, typically 8 to 15 pounds, medicine balls are used for throwing, catching and other moves where the momentum of the heavy ball adds to the challenge.” A Bosu Ball is used for core training and enhances endurance and also helps in recovering from injuries. Lacrosse ball is used for rehabilitation and a Slam ball is used for power training. 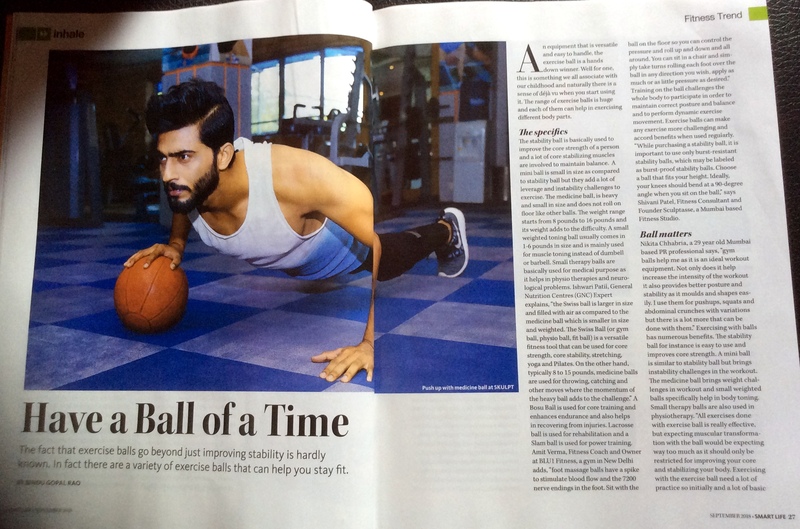 Amit Verma, Fitness Coach and Owner at BLU1 Fitness, a gym in New Delhi adds, “foot massage balls have a spike to stimulate blood flow and the 7200 nerve endings in the foot. Sit with the ball on the floor so you can control the pressure and roll up and down and all around. You can sit in a chair and simply take turns rolling each foot over the ball in any direction you wish, apply as much or as little pressure as desired.” Training on the ball challenges the whole body to participate in order to maintain correct posture and balance and to perform dynamic exercise movement. Exercise balls can make any exercise more challenging and accord benefits when used regularly. “While purchasing a stability ball it is important to use only burst-resistant stability balls, which may be labeled as burst-proof stability balls. Choose a ball that fits your height. 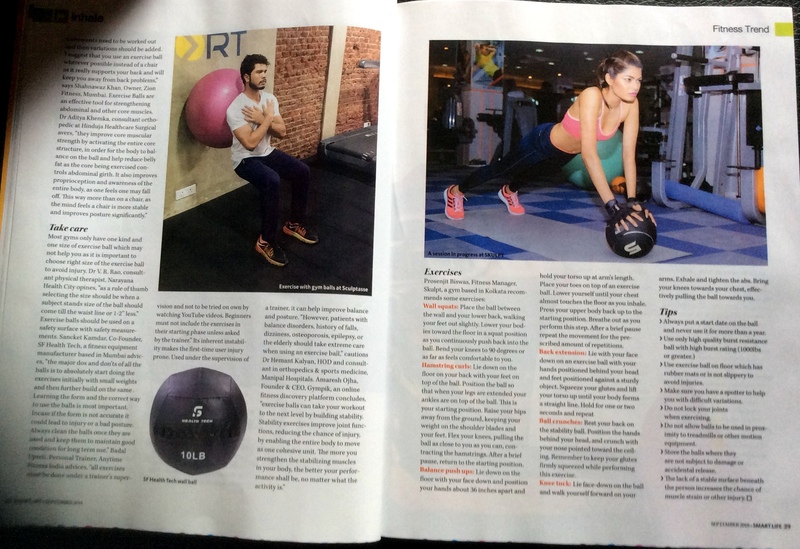 Ideally, your knees should bend at a 90-degree angle when you sit on the ball,” says Shivani Patel, Fitness Consultant and Founder Sculptasse, a Mumbai based Fitness Studio. Wall Squats: Place the ball between the wall and your lower back, walking your feet out slightly. Lower your bodies toward the floor in a squat position as you continuously push back into the ball. Bend your knees to 90 degrees or as far as feels comfortable to you. Hamstring Curls: Lie down on the floor on your back with your feet on top of the ball. Position the ball so that when your legs are extended your ankles are on top of the ball. This is your starting position. Raise your hips away from the ground, keeping your weight on the shoulder blades and your feet. Flex your knees, pulling the ball as close to you as you can, contracting the hamstrings. After a brief pause, return to the starting position. Balance Push Ups: Lie down on the floor with your face down and position your hands about 36 inches apart and hold your torso up at arm’s length. Place your toes on top of an exercise ball. Lower yourself until your chest almost touches the floor as you inhale. Press your upper body back up to the starting position. Breathe out as you perform this step. After a brief pause repeat the movement for the prescribed amount of repetitions. Ball Crunches: Rest your back on the stability ball. Position the hands behind your head, and crunch with your nose pointed toward the ceiling. Remember to keep your glutes firmly squeezed while performing this exercise. Knee Tuck: Lie face-down on the ball and walk yourself forward on your arms. Exhale and tighten the abs. Bring your knees towards your chest, effectively pulling the ball towards you. Always put a start date on the ball and never use it for more than a year. Use exercise ball on floor which has rubber mats or is not slippery to avoid injuries. Make sure you have a spotter to help you with difficult variations. Do not lock your joints when exercising. Do not allow balls to be used in proximity to treadmills or other motion equipment. Store the balls where they are not subject to damage or accidental release. The lack of a stable surface beneath the person increases the chance of muscle strain or other injury.